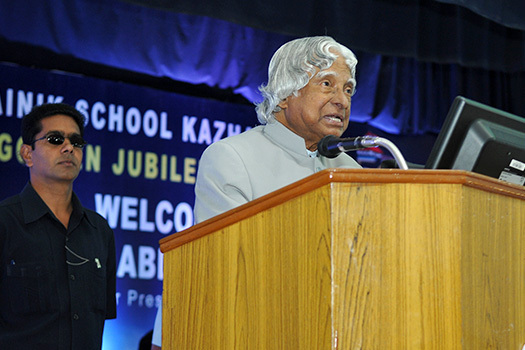 Sainik School Kazhakootam is affiliated to Central Board of Secondary Education, New Delhi. Affiliation No: 930023.
i. All India Secondary School Examination (at the end of Class X)and All India Senior School Certificate Examination (at the end of Class XII) conducted by the Central Board of Secondary Education, New Delhi. ii. Union Public Service Commission Examination for admission to the National Defence Academy, Khadakwasla, Pune & Naval Academy, Ezhimala, Kerala. Mathematics, Social Science, General Science and Art & Craft. (i)	The Board shall conduct examination in all subjects except General Studies, Work Experience, Physical and Health Education, which will be assessed internally by the school. (ii) Similarly Art & Craft for Class X is also a subsidiary subject.